For this very first episode of the Learnetto podcast, I interviewed Kalob Taulien, CTO of Xcellerator Tools and web development teacher. Kalob teaches the very popular Ultimate HTML Developer course here on Learnetto. 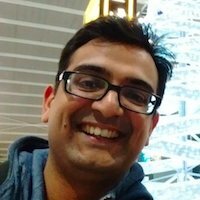 Hrishi Mittal (HM): Welcome to the first episode of the Learnetto podcast. I am Hrishi Mittal, your host and the founder of Learnetto, an awesome new place for learning tech skills online. You can check us out at learnetto.com. So today, I am speaking to Kalob Taulien, the CTO of Xcellerator Tools and author of the complete web developer course and Ultimate HTML Developer course. Kalob is a very experienced software developer and teacher. He has taught web development to thousands of students through his online courses. Let’s listen to Kalob’s story. Hi Kalob, how’s it going? Kalob Taulien (KT): Good, how are you? HM: Yeah I’m good thanks. Thanks for doing this interview - it is the first episode of the Learnetto podcast, so I’m really excited to have you on. KT: Thank you for having me! HM: So, let’s dive right into it. I just want to know a little about yourself; how you got into this and your background as a developer. KT: Right, my background is fairly long actually. I started making websites in 1999; I was 10 years old, somewhere around there. My first website I actually had to make for school and I hated it, believe it or not. Then I had to make two more over the course of a year and by the last one I made - the third one for the year - I was hooked, I was addicted. I was doing really well - I didn’t really know what I was doing per se, but I was scoring higher than everyone else for marks. HM: So you had to do them as part of your course for school? KT: Well it was really only the one year, then it never really happened again. So, I just kept up with it and everyone else just thought it was for school. I decided to take it home and start building on it. I started to learn how to build more advanced websites and websites for teams of people and other groups of people - building forums and all that stuff on my own. Over the years, I started doing some freelancing whilst I was a teenager and just a few years ago, I started my first company. I ended up actually selling that and in between there, I also started teaching. My first course was the Complete Web Developer and I thought it was a fairly big hit. There’s somewhere around 8500 people that have at least taken the course right now legally, as far as I can tell. There’s been some problems with the illegal downloads, but I’ve reached a few thousand people by now with that course. That’s just something I’m very interested in doing, learning how to be a better teacher and to teach people what I have learnt over the past 16 years. HM: Yeah, you seem to have a real passion for teaching people. So, just to go back a bit, you said you started when you were in school that was 1999? HM: And then you just started building all this stuff, and you said you started your first company - what was that? KT: The first company that was really just a website a discount loyalty card that was built into the system. It was purely meant to market the small, local businesses in my city here. That did well enough that another company wanted to buy the assets off me. HM: What city are you in? KT: I’m in Edmonton, Canada. HM: Cool! So you sold that company? KT: I did yeah. I still work with the person that owns that company now. We are good friends and everything seems to be going well with that. HM: Did that lead you into teaching, or how did you get into teaching? KT: I think if I have my timeline right, I was actually teaching before that. Teaching was doing really well. I didn’t have a lot of questions coming in, it was one of those drier times: there weren’t a lot of people coming in, there weren’t a lot of questions. So I started a company, and as the company was growing and in its initial growth phase - you know smaller companies take a little time to grow because they have to incubate. Whilst I was doing that, I was teaching at the same time which sort of balanced it out a little bit because I was learning a lot as a business person and I was also teaching what I was learning for other upcoming developers to become business people. HM: I see. Were you teaching online at the time or in person? KT: It was mostly online although I have taught a few people in person. HM: But your biggest thing has been this web development course? KT: Yeah that’s the biggest course. It’s a few years old now - the quality’s not great - it was fantastic at the time but it certainly needs a little TLC. HM: Tell me more about how your teaching experience has been overall? KT: My teaching experience … over the number of years I’ve been doing it, I would say it’s been up and down. Every quarter changes a little bit. When it’s good, it’s great but when it’s bad, it’s bad - a little boring. So when it’s a little slower, I just take that as an opportunity to improve the course material, to reach out to students that I can reach out to, to talk to them or rebuild any relationships that were built a few years ago, but that I haven’t spoke to for a few years. So I take that opportunity and reconnect with people. When things are going great - well that’s not much else to say! HM: Can you talk about some specific challenges you faced when teaching online? KT: Yeah, okay. The biggest challenge I would say is building the material. You have to create your course curriculum but you don’t necessarily know what people know, what people don’t know, what they want, what they don’t want. It’s much like a startup; I’m big into tech startups too. You can’t really do a lot of validation because you have to build this course then present it to people. Either they like it, or they don’t like it. If they don’t like it, you’ve wasted a ton of time and possibly a ton of money. If they do - great, but there is that risk there. It is a little bit of a gamble. So one of the challenges for me is figuring out what people want to learn. HM: I’ve been thinking a lot about that. As we are slowly launching courses here at Learnetto, when I speak to other teachers and experts like you about doing a course at Learnetto, I do wonder whether we can do some kind of rolling course, where we can release material every week instead of doing some big bang - here are 200 videos go and watch them. KT: More of a drip feed - Coursera does something lke that I believe. If you are learning something professionally that’s a fantastic way to go because it doesn’t swamp you with information. A lot of people who want to learn stuff, in my experience dealing with students want to learn a lot of stuff right away. So they’ll take a number of courses - usually around 3-10 courses in a span of a few weeks and try to get through all of the material right away. What they don’t realise is that when you’re taking 10 courses in the span of a few weeks, that’s a lot of information and it is going to exhaust you - a lot of that information is not going to stick in your brain. So if you could drip that out for people and make it a little slower so that they actually have to practice what they have learned that week rather than learning something new that would be incredibly useful. HM: Yeah, because there is also the effect that people just buy a course because it is there on offer. I’ve done it; I wanted to learn iOS so I bought the course which is just lying there on the desk, I’ve never actually watched the video. Whereas if i know that the next module or chapter is coming by email, I am that much more likely to check it out. KT: Absolutely. One of the challenges with that though is getting people to schedule ou tthe time. HM: It’s a balance, right? KT: Yeah, one of the other challenges I’ve found with that is when it comes to dripping material to students is that they don’t necessarily make the time, because when they are at home, they don’t have anyone to be accountable to - it’s their own self-discipline. Usually in the first couple of weeks, up to the first couple of months things are great. But if your course is longer than two months, then they start to go well I’m not going to take this on Monday, I’ll do it on Wednesday. Wednesday rolls around and they don’t get around to it. All of a sudden, it’s the next week and they are a video behind. 3 weeks later, they are 4 videos behind and they don’t want to do anything because they are behind everyone else. HM: I know what you mean. The way we want to do things is through a hybrid model where especially for developing and new course material you do it on a rolling basis, because -for the reason you said - you don’t know what people are going to like or which parts they are going to want more than others. You are kind of offering a beta of the course. You are trying to build it along the way, but once you build it you could offer it as available for you to download and access all of the material. But you still have the retention, email or notification system where you try to guide the student through to completion. Don’t just give them the course, say goodbye and don’t care whether they complete it or not. KT: I actually think that’s one of the flaws with a lot of the other education platforms. Not to name any specifically, but there are some bigger ones out there who simply just want your money. The teachers actually want to teach and pass down learning from one to another. But the platform just wants students to pay their money and not take the course. HM: We can mention names, it’s OK. We are talking about Udemy mainly, right? There is obviously a ton of content there, but they don’t seem to care about student success. KT: Not really, from what I can tell. Like you said earlier, you see a course on Udemy that you are interested in and buy it, then never get round to taking it. HM: The only email I got from them after buying a course, was one saying buy these other courses. I never got a simple message saying: How did you get on with the iOS course? Did you do the first lesson? I believe as a teacher on Udemy, you are not allowed to message students? KT: We can message them personally on Udemy, one by one. We are not supposed to send them our email addresses, or any content off of Udemy that could lead them to purchase off of Udemy. So, if you had your own platform - Learnetto - and you were messaging people saying to checking out Learnetto, they would have the right to kick you off Udemy. As far as I know, that’s in their terms of service. I could be wrong about that though. It is one of their guidelines; they’ve built this walled garden, where everything inside of Udemy is nice and green but you can’t bring anything outside of that garden, it has to remain inside. HM: I can see why they would want to do that, but it seems very Web 1.0. HM: Especially for education, it seems silly to assume that a student will get everything they want from one platform. I have no such beliefs about my platform Learnetto. I want students to use as many sources as possible, because the idea is to learn the skill properly. KT: I could not agree more with what you just said. HM: Ideally, we would love to provide as many features and tools as possible, so students can do many different things on our platform. But realistically, we don’t want to make a Frankenstein of a product either so I do find it a bit strange. KT: From a business perspective, I totally understand why Udemy is doing it and there are other platforms doing the same thing - and again, from a business perspective it makes perfect sense. However education is a little different and I think this is one of the reasons why not a lot of people have really cracked the ed-tech scene yet. You have to give these teachers more freedom. It’s just like in a normal university, when you go to a normal university is the teacher limited to what they can do? Well they are to some degree, but they also have a lot of freedom. HM: Sure yeah. I’m seeing a lot of different approaches in the online education space. Some people are taking the complete opposite stance to a marketplace model. They are saying the teacher should just rent the software and own everything and do it themselves - Shopify for teaching. KT: Absolutely - there is one out there - it’s actually a fairly good tool, it was called Use for Dora. Teachable, I think their name is now. HM: I think it makes sense, offering teachers really good software with more control, but I think the idea for a marketplace is still very powerful. Helping teachers get more students is a very valuable service. KT: I agree, I agree. One of the things that a marketplace can bring to any sort of service is that feeling of not being alone. Humans are all very social people, we are sociable by nature. We like to see that others are partaking in courses that we may want to enrol in. We want to see other people talking about things, we want to be involved in conversation. A marketplace can bring hundreds of thousands, if not millions of people together whereas an individual course on an individual software, if you are going for consulting or a tutoring course that’s fantastic. But if you want students to learn off each other, ask each other questions, create a community then a marketplace is the way to go. HM: Good, I’m glad you agree because that’s exactly my thinking around that. Again, we want to create a hybrid model where we can provide all of the benefits of a marketplace, such as a community. So a student who is coming to the site to learn CSS or even mobile development may then be interested in taking an HTML course. So, you have that cross between different courses, teachers and students. But at the same time, we would like to give teachers a lot more control over how they do things and how they communicate with students. HM: Absolutely. More generally, in terms of online learning, what else would you improve? KT: What would I improve? Today, I would say teachers need to build more reputation. Using Udemy as an example since I’m an established teacher on Udemy. There’s not really any way for you to build your reputation other than creating new courses, and selling it to more people and getting more people to buy. But that doesn’t really help your reputation as a teacher because your credibility comes from what you know, how many people you’ve positively affected, not just how many courses you’ve sold. I think if teachers could build their reputations inside and outside of the course, connect with other teachers in a positive way so they can help each other - again creating that community. I think - this is purely theoretical - that teachers would do better since they would improve their own skills. If they can improve their own skills then obviously their students will gain from this as well. HM: How specifically would teachers build their reputation? KT: This would come in many different forms. From generic helpful emails - this could be sales emails I guess, but other helpful emails - other videos that are useful, they don’t necessarily have to be in the course, but just hosted on your platform. Here is a tidbit of information about the Canadian economy for instance. It might not be useful for everyone but someone might like it. Instead of putting it on YouTube, you could put it on your platform or both, cross-relate back and forth. You could create a blog where teachers can write their own articles and students can subscribe. HM: That’s interesting because we’ve built that feature for students on Learnetto. Students can have notes, sort of like a blog, they can publish articles about whatever they are learning. They can publish whatever, I’m using this course from Learnetto and these resources from here and there. The idea was the parallel of what you’re saying for teachers, I’m saying for students, and students helping each other to learn better. Because that’s how a lot of people learn on the internet by default, reading other people's’ blogs. In some ways, the distinction between student and teacher is a bit blurred. KM: It certainly is yeah. Students and teachers - I want to say they are different - but they are also very, very similar in what they need. Your feature on Learnetto is absolutely fantastic. My first thought actually was as a business owner and CTO, I’m looking for other people who are well-rounded in development and certainly skilled in other areas. If students are making little posts, or notes that I can publicly see that would help me with head-hunting. That’s certainly a service that I would be willing to pay for - can you find me certain people? And, if you can, can I look down and see what they are posting. If they are posting something interesting, it helps me establish in my mind who they are before meeting and talking to them. HM: And people do this on their own blogs, and now a lot on Medium as well I guess. But providing a specific place to do it, more people might do it, because it’s that place to publish it. KT: It’s that network effect right; the more people that do it, the more people that are going to do it. HM: Right, I think it’s time for a little plug. I would love for you to tell me about the new course you are working on - The Ultimate HTML Developer. KT: Yeah, The Ultimate HTML Developer course is the next step up from what I guess would be the Complete HTML Developer course. My original course what the Complete Web Developer - I mentioned that it was a bit older and the quality wasn’t as good as the standard accepts for 2016. So, I re-did it, added a ton of material to it, really got in depth. Then I cut out lots of the unnecessary bit - a lot of the erms we say, we all do it, we all have those filler words - I cut out a lot of that stuff. I tried to make it straight to the point and, at the end of every video, you get a task. Now the task isn’t going to be terribly difficult, but it’s going to give you hands-on practice right away. Each video is maybe a minute to 4 minutes - somewhere around there is probably the average and right after that, you get hands-on experience. You’re learning it theoretically and you’re learning it in practice. HM: Wow, sounds great. So, we already have this course in beta, on Learnetto, available now. I’ll put the link in the show notes for people to go and check it out. We are offering it for free right now for a few more people whilst we still test out a few last things. It’s going to be a pretty good premium course for people to buy. What’s next for you? Are you working on anything else? KT: I am working on a couple different softwares. The primary focus - where I put in probably 12-14 hours a day right now - is called Xcellerator Tools. That is an Amazon Software Management tool - I suppose you could call it that. It helps Amazon sellers deal with their inventory and stock and products and all that stuff. Amazon offers a tool like that for their sellers called Amazon Central but it stops off but it stops off at the Amazon border. Where that stops, we pick up. I’ve been spending a lot of time there. But I certainly dabble in analytics, I create services just for fun, because I can every now and then. That’s the benefit of being a senior developer; you see a service on the internet and think that would be kind of fun and build your own version of it. Then the Ultimate CSS Developer is probably going to be the next course that I develop. The idea is to take apart from the Complete Web Developer and put it into separate courses where each course can be highly specific. Right now, the Complete Web Developer is a full-stack development course, but I would rather have a very specific course on just HTML, CSS or Java. HM: That sounds good, yeah. I think you can overwhelm people with too much. KT: Exactly, you don’t really need 40 hours of content in a course. They may want that but from what I’ve been finding, most people actually don’t want that. They want to be very specific, very professional in one very narrow area and then when comfortable, expand that. HM: Well, I’m looking forward to both those courses. Thanks very much, it’s been fun! KT: Absolutely, thanks for having me and picking my brain a little bit. It’s been fun - I enjoyed it a lot. HM: I learnt a few things, and I think people will like this!